When you need to make your artwork really stand out a bit, it’s time to get extra creative. This typography deal includes 10 super delicious Font Families. Fonts arrive in multiple file formats: TTF and OTF. This collection of terrific typefaces is just perfect for using on digital and printed projects such as T-shirts, stickers, posters, signs and more. This bundle comes packed with an extended license that allows you to create as many personal and commercial projects as you’d like, using any of the fonts included in here. What Are Web Fonts and Why Are They Valuable? Font can be labeled as a graphic manifestation of text. You can also summarise it as a design pattern for a set of letters and characters. With different shapes, point sizes, font weight, and color, fonts routinely determine the appearance of complete design. 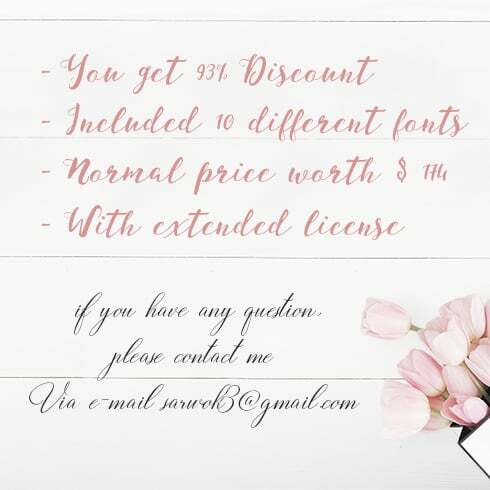 The price on a font range between $7 to $100 based on the marketplace and author. 1. Delivered as an instant download, after completing your purchase. The total size of the files is almost 7.2 Mb. 2. You may use these fonts for both personal and commercial projects, for yourself or on behalf of your clients. 3. This deal includes an Extended License which also allows you to use these graphics in a product offered for sale, provided that the original graphics are not given away. 4. These fonts may be installed on a single computer only. You may not sublicense, resell, share, transfer or otherwise redistribute the actual font files. 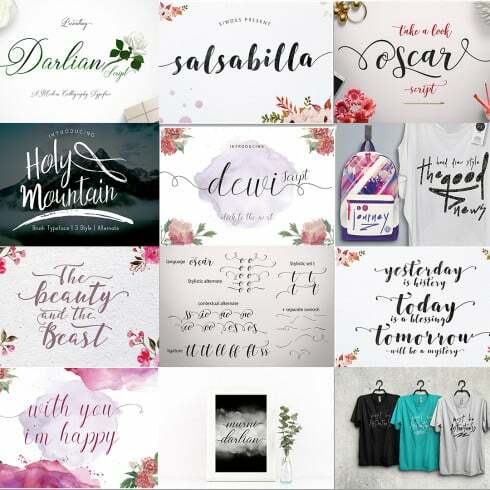 Add a charming feel to your artwork with these fabulous fonts! – Sans-serif – the characters with no dashes at the ends, which gives them a more modern, “minimalistic” style and simplifies the perception of big content fragments. – Script – lovely cursive or handwritten typefaces where characters tend to be crossed with each other. 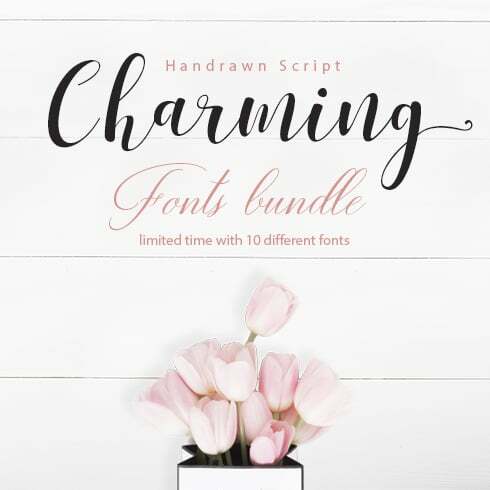 Script is great for creating a stylish, fun and laid back handwritten textual content. – Decorative typefaces – developed mainly for catching the reader’s interest or used for another particular effect or result. What Are The Font Bundles and What Is The Price For Them? A web font kit is simply a collection of various fonts offered at more affordable cost. The best part of getting units is that they cost just a little bit higher than an individual web font does, provided they are on discount. The typical value of a web font package on our website is just two to twenty dollars. However, be quick: the life period of each bundle goes on for less than 5 days. How Can Fonts Impact Perception of the Goods or Company? The quality of typography can help determine how buyers see and grasp written information. Fonts make it possible to capture attention and set up structure. Fonts establish the mood and produce brand attractiveness. Marketers know that typography can make or break just about any graphic ad, business logo, or brand graphics. Whenever one uses poor or generic typography, people see the design as low quality and do not keep reading. In the event the font is un-readable, the whole artistic endeavor does not work out to achieve its objectives. I Have Not Found Any Suitable Fonts in This Specific Font Bundle. ? In case you haven’t spotted the right font inside this font bundle, do not lose hope! There are hundreds of bundles provided by the best designers on MasterBundles. Invest time to run through them all and you will find the right package! It’s so satisfying to eventually unearth the offer that fits your artistic and professional needs. Any Alternative Web Bundles Do You Sell on Master Bundles? On top of font bundle deals, our marketplace offers many spectacular bundles. Have a look at web template deals, icons, textures, and patterns, image bundles. There are additionally electronic books and courses, stock photography, logos, illustrations and add-ons, mockups, as well as other categories. You’ll find thematic Christmas and Valentine’s day packages, postcards and powerpoint presentations. And also, of course, our absolute favorite under $5 deals! MasterBundles is the very best place for buying web design solutions that will surely simplify your work process. In order to make our web products and sets inexpensive for all regardless of their funds, we frequently offer massive discounts and manage regular sales. However, you got to be attentive, as the deals on most packages last for less than five days. In case you don’t want to miss the sales, just register for MasterBundles newsletter and stay up-to-date with the latest arrivals and accessible coupon codes. To view the available discount coupons, go to this page.